L-Space Web - Home of Discworldian affairs on the net. Friday, 19-Apr-2019 23:31:33 PDT Greetings All Students New & Old! Some people have reminded me that we do have students and that apparently it may be a good idea to help them out with regard as to what actually goes on here and more important on the discussion list. Seeing that I'm the Arch Chancellor it probably should be me. Well obviously if you haven't been told yet, Bugarup University is located on XXXX which is a continent of the Discworld (which is carried on the back of Great A'Tuin star turtle by four giant elephants and why not.) which appears extensively in the book "The Last Continent" by the living deity Mr. Terry Pratchett (why not again.) Ours is a University (the capital 'U' is important, makes things look more professional.) 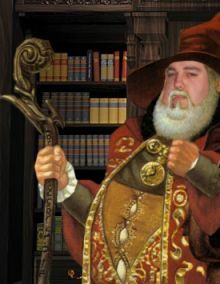 which deals in the art of magic and is loosely based on the Unseen university of Ankh-Morpork. We try to talk about anything Pratchettesque: tours, new books, old books, computer games, figurines, memos, assassination attempts, tonight's dinner menu, wossnames and such. Keep a look out for BUNS appearing under your dorm room door. I mean the Bugarup University Newsletter (for) Students. Bad form the fellow who thought otherwise. Oh well top hull. Must dash back to my room I've some important dinn-, um, papers to look at. More news on the state of University affairs will appear on the web site soon. Well, um, onward and upward. Chat with us! Come and visit us in the all new Uncommon Room for chat type activities. Got a web page? Link to us and we'll return the favour!